From March to August 2016, CJE worked in coalition with Court Reform LLC and a statewide coalition that we pulled together to audit the California Commission on Judicial Performance (CJP), the powerful state agency that is supposed to be disciplining our state’s nearly 2,000 judges when they violate the canons of judicial ethics. As the sole oversight agency of California’s judiciary, the CJP plays a critical role in maintaining the integrity of the courts and promoting a fair justice system. Such a vital agency should not operate in secret, nor should it withhold important information from the public, which it has been doing for the past 56 years. The CJP admits that less than 2% of all complaints filed by average California litigants or their family and friends have resulted in the discipline of our state’s judges, in a 20 year report. This is a disturbing statistic that proves the need to reform the state’s only judicial oversight agency, which was created back in 1961 in large part to “protect the public.” The CJP is clearly failing in its mission. 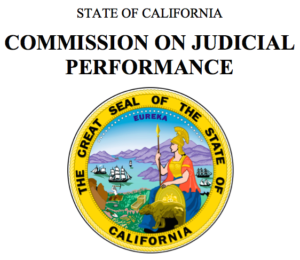 On August 10, 2016, the California Legislature approved our historic request to audit the California Commission on Judicial Performance for the first time since its creation in 1961. The audit enjoyed widespread bipartisan support from the Legislature, court reform advocates, and yes, even California judges. The CJP announced that it welcomed the audit and was happy to present evidence that it was complying with its Constitutional mandate to protect the public. Kudos to Assemblywoman Catharine Baker for her tremendous courage and leadership in bringing the public’s concerns about the Commission on Judicial Performance to the Joint Legislative Audit Committee! She worked closely with Senator Hannah Beth Jackson to get this critical request placed on the committee’s consent calendar, and she deserves our sincere thanks! And a huge thank you to all of the individuals who wrote letters, made calls and sent emails to urge the JLAC committee members to support the audit! Despite the CJP’s attempt to block the state auditor from doing her job, with their San Francisco lawsuit, we are thrilled to see the state legislature finally awakening to its responsibility to provide checks and balances to this important branch of government that wields tremendous power over the lives of millions of Californians. The audit is currently stalled pending resolution of the CJP Lawsuit Against California State Auditor. Check out CJE’s Blog Post: Is the CJP Letting the Criminal Statute of Limitations Run on Egregious Judicial Misconduct Cases? Read this 2010 letter to see how the Judicial Branch has tried to thwart the State Auditor in the past. If you filed a complaint with the CJP, please contact the state auditors office. They have a voicemail where you can leave information for the CJP audit team, just call (916) 445-0255 and ask to be transferred over to the CJP audit team’s voicemail.